This week I attended the Johannesburg launch of Gabeba Baderoon’s Regarding Muslims: From Slavery to Post-Apartheid. In it, she traces the long history of the representation of Muslims in South Africa, arguing that this is crucial to understanding how ideas around race and sexuality, for instance, have changed over time in this country. 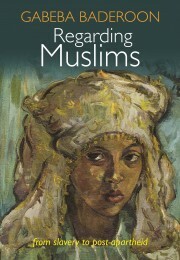 Importantly, though, she also looks at how Muslims themselves have both responded to and challenged the ways in which they have been portrayed. She devotes an excellent chapter to the meanings and uses of ‘Cape Malay’ cooking. This is a cuisine, Baderoon notes, that carries with it the memory of enslavement and violence – a memory which was erased, in particular, by the recipe books written by white authors about the cooking of the Cape’s Muslim population, most of whom are the descendants of slaves. Part of the purpose of books such as Renata Coetzee’s The South African Culinary Tradition (1977) was to use this cooking to demonstrate the existence of a particularly South African cuisine which was linked more strongly to Europe – albeit heavily influenced by southeast Asia – than Africa. meant that Muslim food would no longer be a realm presided over by white experts who drew from silent or apparently submissive black informants in their kitchens, and spoke on their behalf. The transformation of Muslim cooks from silent informants to spokespeople of tradition began to subvert the use of ‘Malay’ food to solidify a ‘general’ South African cuisine that marginalised Africans and centred a European-oriented whiteness. Baderoon uses the example of the Hertzoggie to demonstrate how Malay food encodes a fraught, but also subversive, history. Hertzoggies are small – delicious – cookies consisting of a layer of pastry, a blob of jam (usually apricot), and a dome of desiccated coconut. They’re named after JBM Hertzog, Prime Minister of South Africa between 1924 and 1939. Representing largely the interests of white Afrikaners, Hertzog oversaw legislation which further entrenched segregation. The landmark 1936 Native Trust and Land Act and Native Representation Act not only further restricted the land that Africans could hold, but also removed those Africans who qualified to vote from the voters’ roll in the Cape and dashed any hopes of extending the franchise to blacks nationally. [Hertzog] made two promises … He said that he would give the women a vote, en hy sal die slawe dieselfde as die wittes maak he will make the Malays equal to the whites. Achmat [Davids, the late linguist and historian] reckoned the Malays became terribly excited about this and they put this little short-crust pastry with apple jelly underneath and then had the egg white and coconut on top of it and baked it and called it a Hertzoggie in honour of General Hertzog. However, when he came into power he fulfilled one promise, he gave the vote to the women, but he didn’t make the slaves the same as the whites. So the Malays became very upset and they took that very same Hertzoggie and covered it with brown icing, you know, this runny brown icing and pink icing and they call it a twee-gevreetjie [hypocrite]. I had never heard this account of the origins of the Hertzoggie before and it rings entirely true for me – particularly because of the widespread use of desiccated coconut in Cape Malay baking. It demonstrates Baderoon’s point about the use of food as a form of subversion by people otherwise socially, politically, and economically marginalised, particularly well. However, I think that it’s also worth thinking about the Hertzoggie in relation to other baking traditions. It’s a little difficult to keep apart these different strands of South African cooking. Hertzoggies appear in recipe books written by – and, presumably, for – white, middle-class class women during the 1930s. And, often, they placed alongside recipes for Jan Smutsies or Smuts-Koekies. Jan Smuts – statesman, war general, philosopher – was Hertzog’s main political rival. Although the differences between Smuts and Hertzog’s politics, particularly as regards segregation, should not be overstated – after all, they formed the fusion government between 1934 and 1939 – they tended to represent opposing liberal and conservative impulses within South African politics during the 1920s and 1930s. Smutsies are similar to Hertzoggies, but have a plain pastry instead of coconut lid covering the jam. Was the relative austerity of Smutsies a commentary on his asceticism? That said, other recipes imply that Smutsies and Hertzoggies are, in fact, exactly the same – only the name changes according to the political sympathies of the baker (or the eater). I don’t write this to undermine Baderoon’s argument, but, rather, to note how entangled South Africa’s culinary traditions are. Also, I want to reinforce her point about the subversive potential of food: that a biscuit invented by poor, black, Muslim women first in support of, and then in criticism of, a political figure could be taken up and celebrated by precisely the people who voted for him. Gabeba Baderoon, Regarding Muslims: From Slavery to Post-Apartheid (Johannesburg: Wits University Press, 2014). William Beinart, Twentieth Century South Africa, new edition (Oxford: Oxford University Press, 2010). Saul Dubow, Apartheid, 1948-1994 (Oxford: Oxford University Press, 2014). Ahhhhhh, what a satisfying read, intellectually as well as gastronomically, as I sip my morning coffee and long for such delicacies to accompany it. Thanks for the link to my blog! I love your blog – very interesting!